Co-founder of #styleitdark, art collector, and dark interior lover, I'm so thrilled to have this lady agree to a home tour on the blog today. 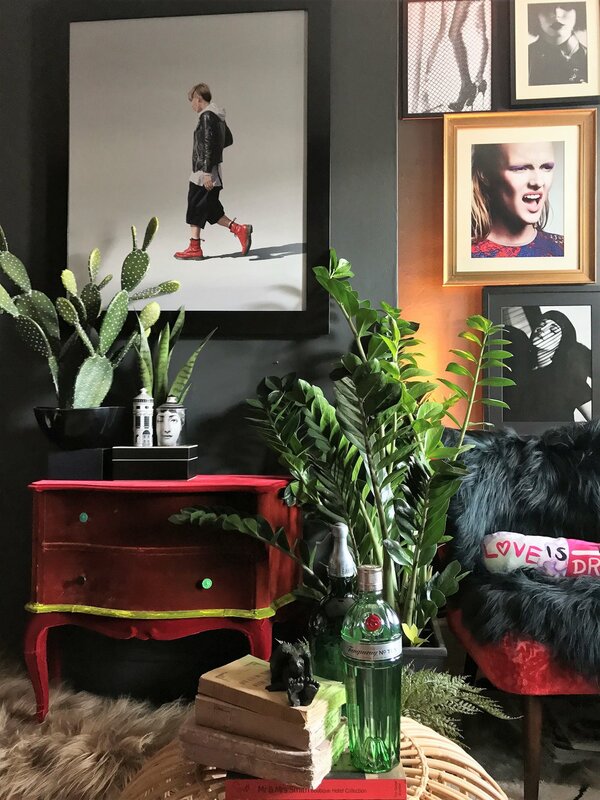 It's the fantastic Jasmine Edwards @jazzierere, who knows how to pull a room together, with dark, moody colours, pops of colour, fantastic art, statement lighting and great home accessories. Jaz tells us a bit about her inspiration throughout this tour and a bit about her home. Hello there, my name is Jasmine and I live with my husband Mark in Surrey. I’m a Facilities Management practitioner and my husband is a Managing Director for a company that creates solutions within the Industrial Electrical market. Our working lives occupies a lot of our time and mine is further consumed by studying part time for an executive MBA at university. I can find myself completely mentally taxed and by treating our home as a creative outlet it is the perfect antidote to stress. We have lived in our Victorian period property for the last 6 years and thus far it could be called a labour of love. Considering the house’s age any frustrations I have towards it are related to layout and configuration issues as opposed to disrepair considerations. When we moved in we had big plans to completely remodel and its currently still being given serious consideration. The naïve part of me thinks that it would be great to fulfil the house’s full potential. However, pragmatically speaking the inevitable spiralling costs, disruption, never-ending upheaval and unrelenting chaos would probably give me permanent indigestion. Ok so I admit it I can be a tad dramatic. Thus, it’s no surprise to see the almost theatrical approach I have towards interior design. It’s evidenced by my usage of an unrestrained colour pallet, huge statement lighting and the large amounts of art that is peppered throughout our home. It really makes me laugh when I recall that when I first started going out with my husband he bought me a book on minimalist decorating and suffice it to say he’s realised that this not the case. However, I think your home should be exactly where you are able to express yourself creatively without judgment. Many of the changes to the house have been aesthetic with the most amount of work done in the garden which is ironic as it’s the least used space. It was originally compartmentalised by fences and gates into different zones which we stupidly removed to create an open space. But when it’s overgrown it resembles the wild. I often think a flame thrower is the only way to resolve this problem and often wish it was compartmentalised again! The darkly coloured aesthetic used as a backdrop that is pervasive throughout the house was an organic process and a way of creating flow between the different rooms. Funnily enough when we moved in the house was all painted magnolia apart from the dining room which was a fetching shade of peach that induced instant toothache. From what I recall I was tempted to forgo the unpacking and try and rectify this straightaway but even I had to shelve that idea and wait. The house is a mash up of styles and eras jostling with one another and different textures abound in each room. Everything is put together using gut instinct The dining room and kitchen are painted in deep dark blues, black and grey (perhaps it’s to disguise food when people come over to eat?! Whilst the living room is deliberately accessorised in high octane brighter colours which seems to suit the upbeat mood of the room. Our main bedroom is dramatic due to its size but it’s a surprisingly comfortable place to relax and its south facing so lets in lots of light. I’ve been relatively restrained in the hallways but the study in contrast has lots to look at and is perfect for distracting me when I should be working. When it comes to interior decorating as with most things in life I tend to err away from conventionality & therefore I’m not overly concerned about my choices as they are not structural. My somewhat challenged logic works on the principal that it can all be changed easily if we decide to sell. Overall, I have set out to create an interesting vibe rather than it being polite and considered. It stands about as much chance of being featured in The World of Interiors as I do of chartering a rocket to the moon and this is fine with me. It’s a home that you can relax in and I think it’s important to be grounded, decent and to appreciate everything you have. I also think it’s not about what you don’t have its about being grateful for what you do have in this mad old world.